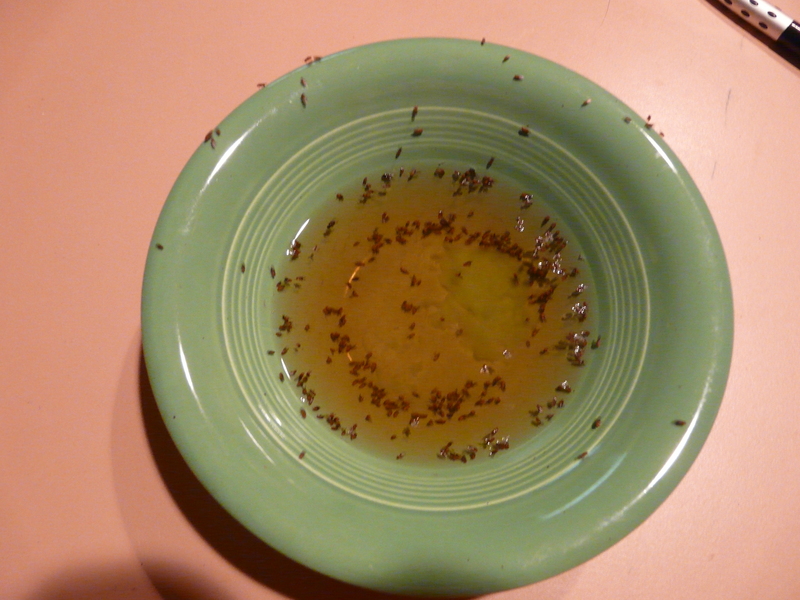 Fruit-flies check in and never check out. Do they die with smiles on their faces? It should be enough for a curtain, appliance covers and whatever else comes to mind. I’ve all ready got watermelon fabric for a tablecloth. And there’s those tea towels to embroider. I have so many ideas. 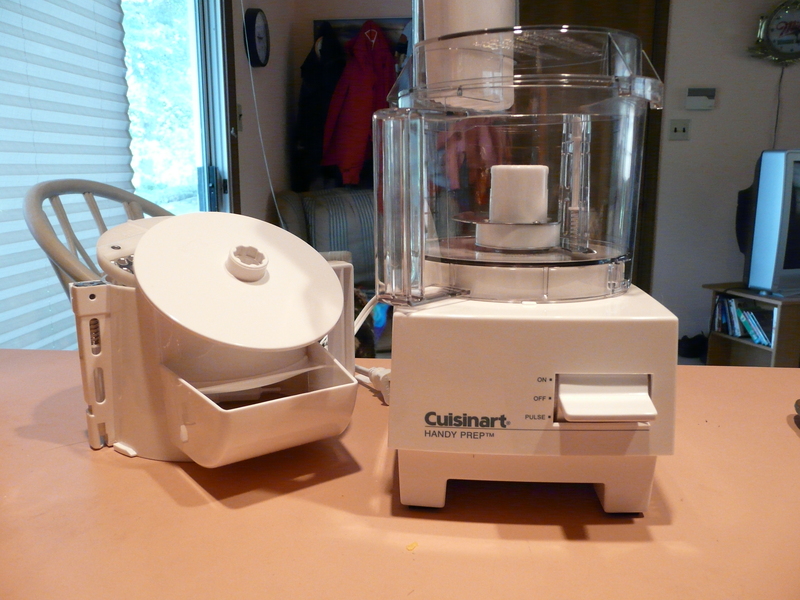 The kitchen is going to look like Martha Stewart on drugs. Poor Sweetums. Now. When do I start? Beats the sh*t out of me! 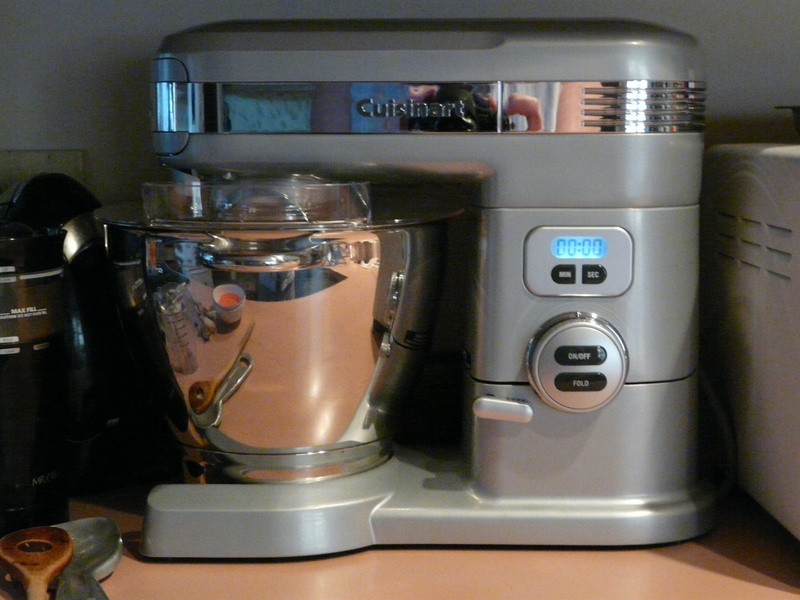 It’s a bit hard to get excited about it when the kitchen is still in two rooms. We have to wait for Frank to have time. It may not be until Winter when he can’t work outside. I’ve got this to keep me busy in the meantime. Tags:fabirc, kitchen, Martha Stewart on drugs, tea towels, What's Cookin'? 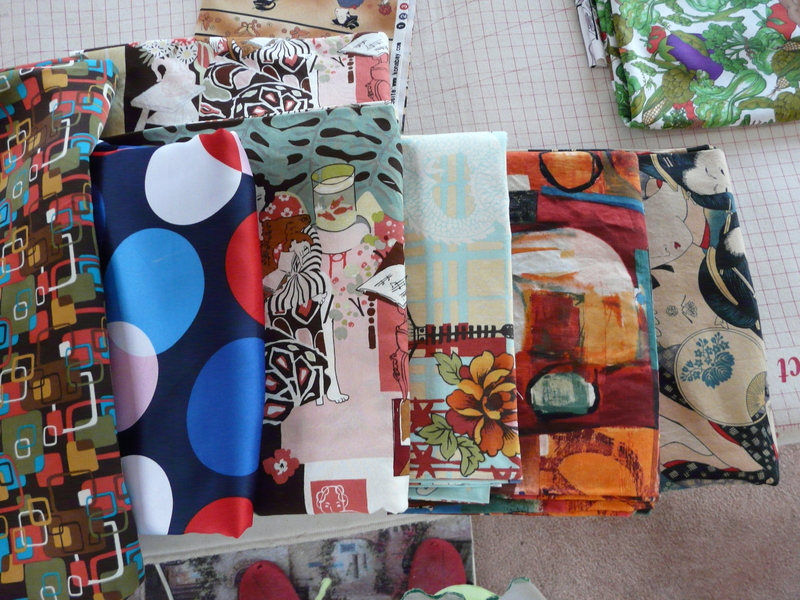 I visited no less than three fabric shops and bought fabric for six tops and five pants. Well. If I’m going to have new blouses, I need new pants to go with them. This was getting to be far too expensive. Now, I believe that I mentioned getting rid of blouses and making new ones. I may also get rid of the old pants that I haven’t gotten around to taking in. I’m not sure about that yet. They are nice. I’d better not die anytime soon. I’ve got too much stuff. So, I went on-line. Well, duh. 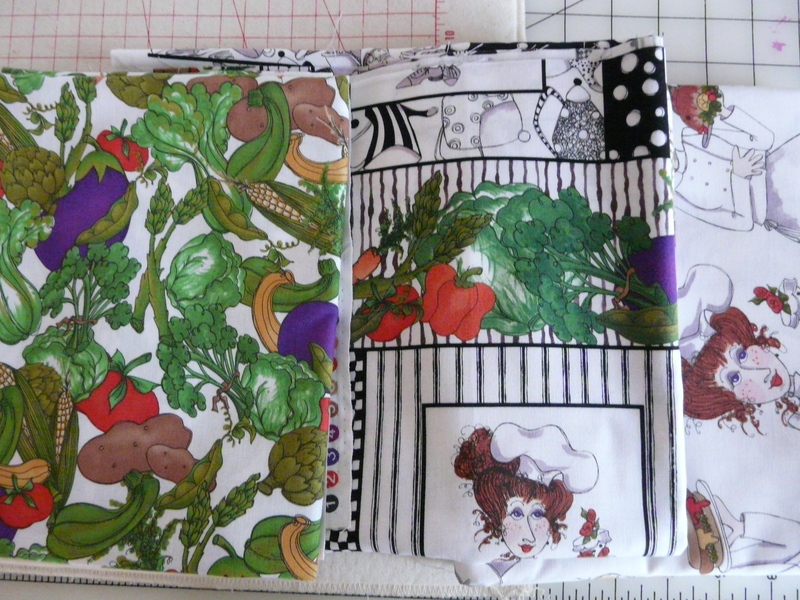 After about four hours of driving myself crazy, I finally settled on three coordinating fabrics. I might as well make new curtains. And pot holders. 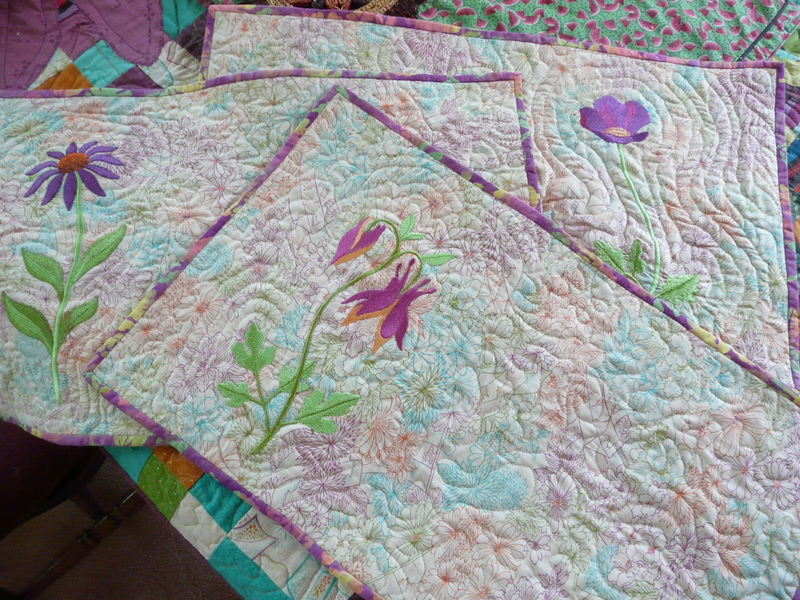 And, maybe, placemats. It’s all going to look so CUTE!!!. I hope Sweetums doesn’t puke. He called last week and asked me to bring my sewing machine. Did he have some mending? No. He wanted to make his girlfriend a dress. Friday evening, we went shopping. He found a pattern, a simple wrap dress. The fabric he fell in love with was a shiny polyester. Not a good idea for a first project, but I couldn’t sway him. We also got interfacing and thread and headed home. 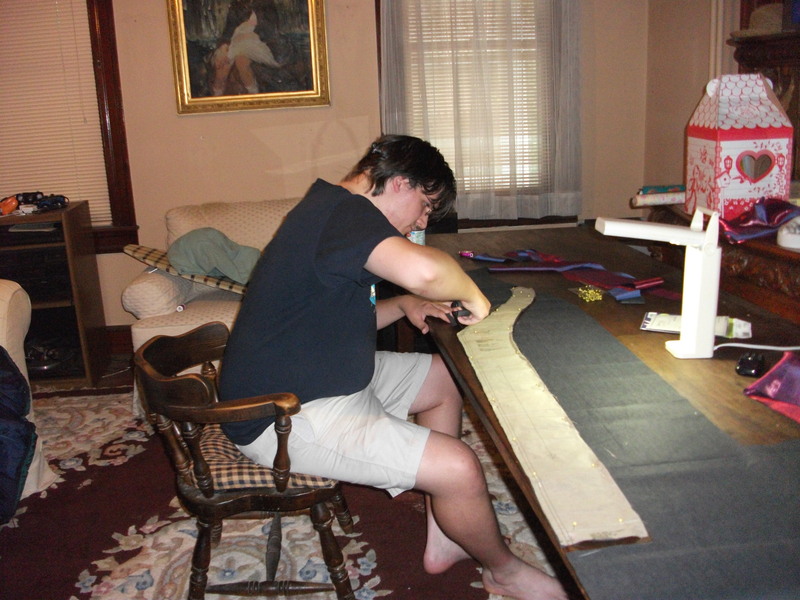 Saturday, we cut and started sewing. My son is 6′ 5″. It was easier for him to sit and cut. Even Biscuit was amazed at his progress! 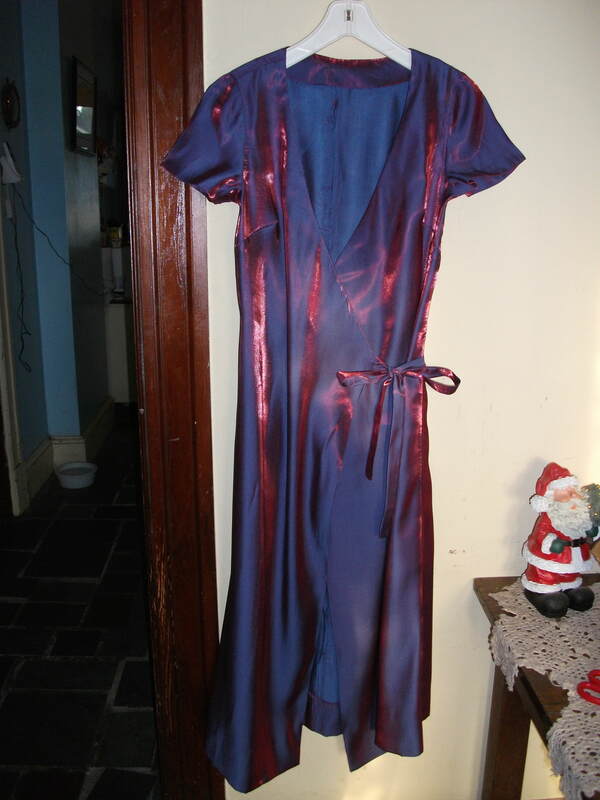 And, here we have the finished dress. He was rather pleased with himself. And I cannot say that I was not proud of him. OK. I will admit that I did some of the harder parts, but it’s mostly his work. We only had two days. And, you know what? He wants to do it again! I haven’t been all summer so it’s time. I hope it’s not raining like this tomorrow. Ordinarily I would have all ready left, but I have an appointment with the GP in the morning. My son wants sewing lessons. We’ll be looking at patterns and buying fabric, cutting and sewing. He has my old Brother, but I’m bringing my Sapphire anyway. I am not certain what all is at the house so I’ll bring some basic notions. This should be fun. I’ll let you know. I’m trying to picture him making his own placemats. 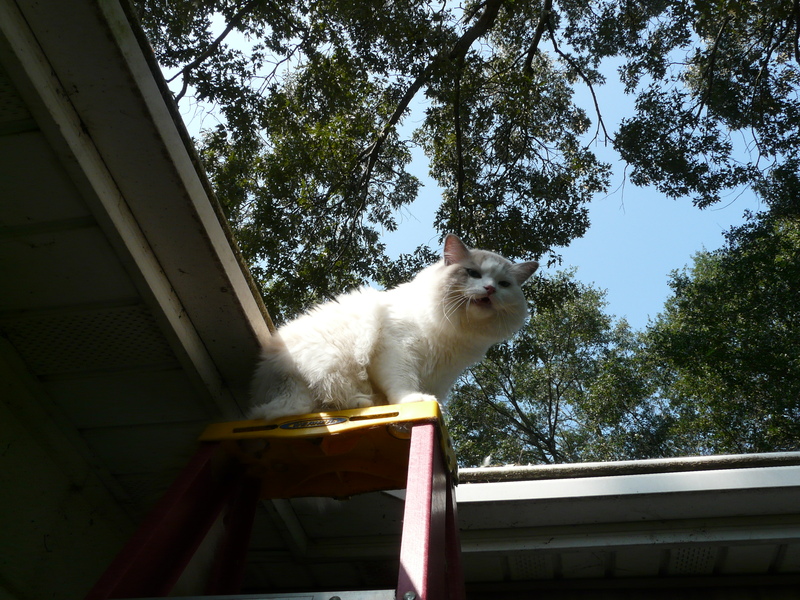 Last week, Rue finally got up the nerve to climb the ladder and get on the roof. The roof is Cora’s favorite Hang Out. She was NOT happy! Last week, Rue climbed back down the ladder. This week, he forgot. Nothing could entice him to climb back down, not even his favorite food. So we ignored him. It didn’t work. He went into a complete panic. After two hours, Sweetums climbed the ladder and carried him down. He didn’t go anywhere near the ladder for a few days. 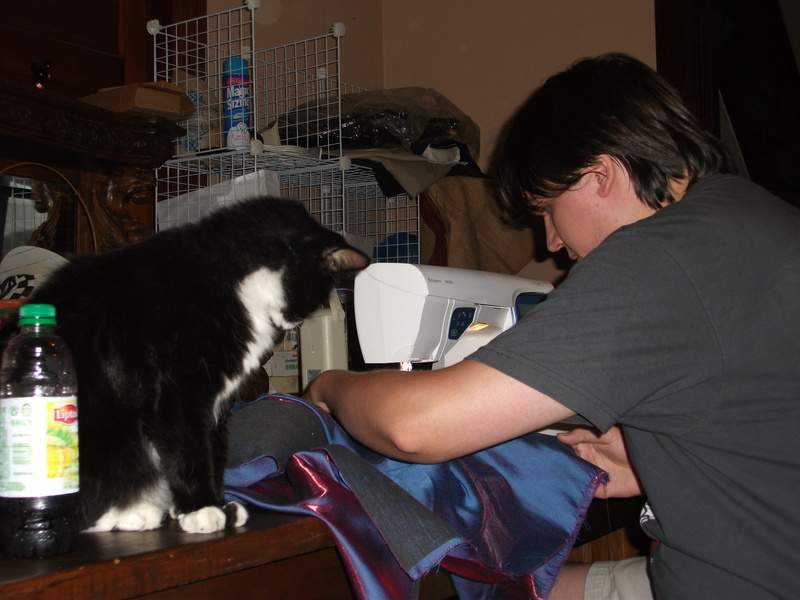 This afternoon,while I was sewing, I heard a cat crying. And there he was–sitting at the top of the ladder crying. I called Sweetums to get him. He climbed the ladder, picked him up and brought him down. Rue considers this the way to get down now. He’s the baby. You gotta love him. Posted in my pets | Comments Off on When Will He Ever Learn?